St. Petersburg's second largest musical stage, whose repertoire includes world classics of opera and ballet. Among the works in the programme are Borodin's "Prince Igor", Verdi's "La Traviata" and "Requiem", Rossini's "The Barber of Seville", Bizet's "Carmen". The first performance on the stage of the Emperor the Musorgsky Theatre, just built by the architect A.Brullov. The brilliantly suitable to the architectural ensemble of Michailovskaya square building became the third Emperor stage in Saint Petersburg. But differently from its neighbors - the Mariinsky and Alexandrovsky theatres - this stage did not have its own troupe and definite repertoire and genre tendency. Firstly the theatre building was mainly used as a concert hall. But, to tell the truth, there were opera performances among drama performances and musical comedies performed by the troupe of the Alexandrinsky theatre or coming French and German actors. There were they who noted the necessity of enlarging the sizes of stage and hall. Followed in 1859 rebuilding made the inner shapes of the theatre similar to the requirements for scale opera and ballet performances. until that moment when musical performances were constant at Mikhailovsky stage, it was long time. The French drama troupe and the German competitor. Seldom opera performances at Mikhailovsky stage were organized mainly with the help of the Emperor Russian opera (the Mariinsky theatre). In connection with the repairing of Mariinka in 1894 opera performances became often, the tradition of every Sunday opera performances was set up, but later it disappeared. But The Great October Revolution changed the fortune of the theatre a lot. After the French troupe leaving the Mikhailovsky stage, the problem of forming the own theatre troupe. 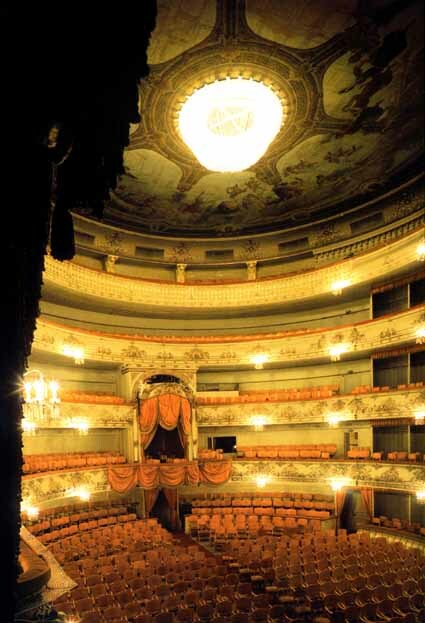 Under the initiative of A.V.Lunacharsky the theatre was to be the second opera theatre in Petrograd. "Born by revolution"-this title was the characteristics of a new opera troupe for a long time which really became forming in 4 months after the establishment of the Soviet power. The second birthday of the Mikhailovsky theatre is on 6 March 1918, and also of his opera troupe. That day the theatre opened its doors again, "The Sevilla Barber" was presented to the spectators. But the birthday can be called so very conditionally:The Mariinsky Theatre troupe continued its performances on the stage of Michailovsky theater (but now the stage was state, not Emperor). It's own orchestra. Chorus and mimance will appear only in he next season, but the soloists (up to early 30's) will be from the Mariinsky theatre. But a new theatre was born. What happened in nearest years was great. A young theatre gained its own image, its aesthetic credo very soon. The concentration on entertaining and comical material was reflected in a new title that was gained by the theatre in 1920. The state Academic theatre of comical opera. But the title was changed again very soon; since 1921 the theatre got the name of Maly Academic Theatre, and since 1926 - Leningrad Academic Maly Opera Theatre (Malegot for short). Malegot did not follow any genre restrictions in its repertoire and staged both classical opera heritage and light operetta or experimental modern compositions. By the mid 20's, during new economic politics operetta started to prevail at stage. The second half of 20's was marked by "modernism": turn to stict experimental samples of new opera art (opera of E.Kshenek, E.Dressel, D.Shostakovich) - a phase afterwards estimated by critics as "the furthest point of turning from realistic trend"), and now understood as one of the brightest pages of Malegot's history, fully reflected all searches of "gold" 20's. In 30's while setting up the concept of socialistic realism in Soviet art the development of the theatre started its new period and for many years it became the laboratory of Soviet opera. All mistakes and achievement the theatre had with its epoch, it's rising and reflected the line of social and art life quite exactly. The masterpieces that are famous now but some time ago caused a lot of arguments and different opinions such as Shostacovich's "Nose" and "Lady Macbeth of Mzensk uyezd" and Prokofiev's "War and Piece" are obliged to Malegot by its staging birth. Godunov" S.Gaudasinsky, directed the theatre since 1981,could restore the traditions of "the theatre a singer and actor", which Malegot was famous for in the period of its coming-to-be. The everyday rehearsal work was directed by a producer to working out vocal speech by actors. The chorus was completely changed from undifferencial people into the mobile multifaced company of actors. The stage of the theatre became a real school of actor art for soloists. The repertoire politics of the theatre was also changed. The main strategic task was to revive the opera theatre of Russian classics at the stage of Maly theatre. One by one the opera masterpieces of Russian composer came back into the repertoire: Musorgsky's "Boris and "Khovanshina", Chaikovsky's "Eugeny Onegin" and "Queen of Spades", Rimsky-Korsakov's "Golden Cockerel" and "A tale about Tsar Saltan", Borodin's "Grand Duke Igor". Russian opera became an aesthetic credo of the theatre. 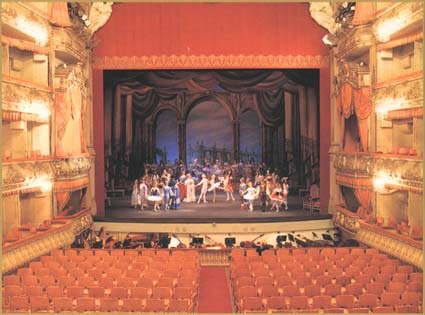 The range of the task made the theatre to change its name once again because the title "Maly" was not suitable for the theatre stage ideas any more. Since 1989 Malegot became Saint-Petersburg Academic Mussorgsky Opera and Ballet Theatre. The name of Musorgsky was not accidental. The staging of "Boris Godunov" was the greatest and the most important success of the theatre, promoting the renewing of Russian repertoire. At the same time together with Russian classics the European opera including its modern samples (M.Landovky's "Madman" and K.Michem's "Tartuf") and even operetta continue living at opera stage (one of the last works of I.Strausss - "The Bat" - is a light sample of creative diapason of the troupe). Even the most popular opera compositions, such as Verdi's "Traviata" get here new sounding and freshness.